This issue is making me a little crazy (I know a personal problem :). I see a lot of posts from developers who are hoping the new Web Application Projects will solve a perceived problem with the current dynamic compilation model. All other code (Data Access Layer and Business Logic Layer code) resides in the "App_Code" directory. To create a DotNetNuke module, you create a folder in the "DesktopModules" directory for your module and one in the "App-Code" directory. 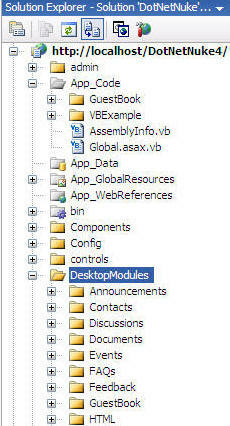 Then you simply right-click on the folder and "Add New Item.."
And then start writing code. Click save and re-fresh your web browser to see the results. The reason I am advocating this method is that for beginners, they don't have to learn a complicated Visual Studio configuration, nor do they have to learn how to use additional external programs. The reason I am advocating this method for advanced developers is because it is extremely fast to develop this way. In my current tutorial I use the DotNetNuke module templates and then replace a lot of code so the simplicity of the development process may have gotten lost in the 8 page tutorial. In the latest tutorial that will be released when DotNetNuke 4.1 is released, I will show how to use the method described above and the tutorial is only 4 pages. Now a lot of current developers use the CodeSmith templates to create the large amount of code needed for the Data Access layer. With the DAL+ coming in the next version (4.1) there will be a 60% reduction of code so you may not need the templates anymore. Also, working with the Source code version of DotnetNuke can be painfully slow. My recommendation is to not use it. I use the DotNetNuke Starter kit to develop my modules. This compiles fast and is easy to set-up. I hope that current Dotnetnuke developers will let go of the methods they currently use and see the incredible gains in productivity that VS2005 offers. Use dynamic compilation to improve development speed and to reduce configuration. Use Generics and ObjectDataSources to reduce code and implement pure OO design. The only thing the new Web Application Projects provides is the ability to compile your DotNetNuke module into one assembly rather than multiple assemblies. Why is this so important when you still have to distribute a dozen or so files that consist of your web user controls and resource files? I am confidant the beginning developers will accept these easy to learn and fast to use methods. I just hope the current DotNetNuke developers will see the advantages also.